Συμμετοχή ως συγγραφέας στη συγγραφή συγγραμμάτων στον τομέα της Επεμβατικής Καρδιολογίας. Πρόγραμμα γενετικού ελέγχου οικογενειών με αρρυθμιογόνο μυοκαρδιοπάθεια της δεξιάς κοιλίας (Naxos disease), St. George’s Hospital Medical School, London UK και «Ιατρικό Κέντρο Ι. Πρωτονοτάριος, Νάξος» (1995). 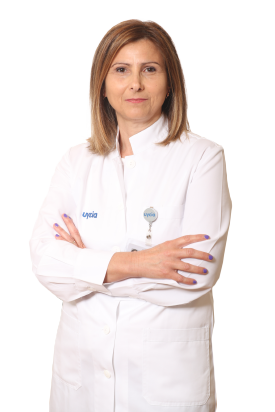 Katritsis DG, Sotiropoulou P, Giazitzoglou E, Karvouni E, Papamichail M. Electrophysiological effects of intracoronary transplantation of autologous mesenchymal and endothelial progenitor cells. Europace. 2007 Mar;9(3):167-71. Epub 2007 Feb 1. PubMed PMID: 17272327. Katritsis DG, Korovesis S, Karvouni E, Giazitzoglou E, Karabinos I, Tzanalaridou E, Panagiotakos D, Webb-Peploe MM. Handgrip-enhanced myocardial fractional flow reserve for assessment of coronary artery stenoses. Am Heart J. 2006 May;151(5):1107.e1-7. PubMed PMID: 16644345. Ioannidis JP, Karvouni E, Katritsis DG. Creatine kinase-MB elevation following stent implantation. J Am Coll Cardiol. 2005 Jun 7;45(11):1908; author reply 1908-9. PubMed PMID: 15936632. Katritsis DG, Karvouni E, Ioannidis JP. Meta-analysis comparing drug-eluting stents with bare metal stents. Am J Cardiol. 2005 Mar 1;95(5):640-3. PubMed PMID:15721109. Ioannidis JP, Karvouni E, Katritsis DG. Mortality risk conferred by small elevations of creatine kinase-MB isoenzyme after percutaneous coronary intervention. J Am Coll Cardiol. 2003 Oct 15;42(8):1406-11. PubMed PMID: 14563583. Katritsis D, Karvouni E, Webb-Peploe MM. Reperfusion in acute myocardial infarction: current concepts. Prog Cardiovasc Dis. 2003 May-Jun;45(6):481-92. Review. PubMed PMID: 12800129. Karvouni E, Katritsis DG, Ioannidis JP. Intravenous glycoprotein IIb/IIIa receptor antagonists reduce mortality after percutaneous coronary interventions. J Am Coll Cardiol. 2003 Jan 1;41(1):26-32. PubMed PMID: 12570940. Karvouni E, Stankovic G, Albiero R, Takagi T, Corvaja N, Vaghetti M, Di Mario C, Colombo A. Cutting balloon angioplasty for treatment of calcified coronary lesions. Catheter Cardiovasc Interv. 2001 Dec;54(4):473-81. PubMed PMID: 11747183.
stepping away». Circulation. 2000 Jul 25;102(4):371-3. PubMed PMID: 10908206. Di Mario C, Karvouni E. The bigger, the better: true also for in-stent restenosis? Eur Heart J. 2000 May;21(9):710-1. PubMed PMID: 10739725.